The intersection of intelligent, augmented and experiential technologies offer new paradigms across the spectrum of Healthcare. Harnessing what these technologies have to offer, and integrating it to build effective, scalable, cost effective solutions is where the future heralds. 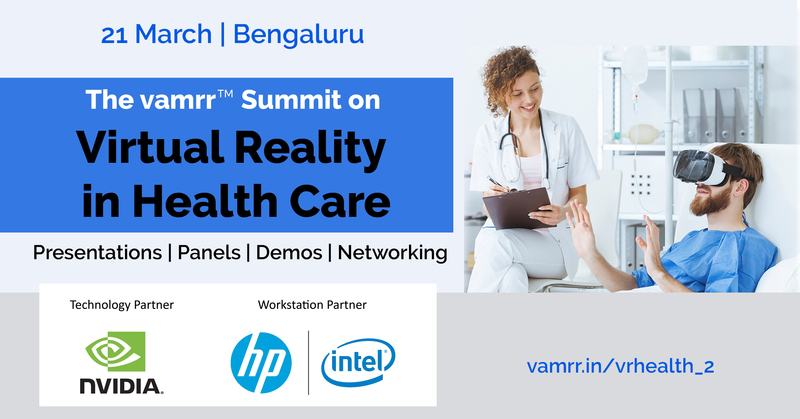 It will be attended by Medical Practitioners, Health Care Professionals, Hospitals & Healthcare Organizations, Health Tech Companies, Technology Companies, IT Companies, VR & Immersive Technology Ecosystem, Research Labs, Game Development Companies, Investment & Funding Professionals, Educational Institutions. The conference is free to attend but by invite only. Please fill the form at the bottom of this page to register for the event and we will send across an invitation. Validation of effectiveness of VR & AR in Health | Making a case of ROI & Better Health Care through investing time, resources and focus in VR Solutions.